Today was our first day of the Movement Exchange experience. 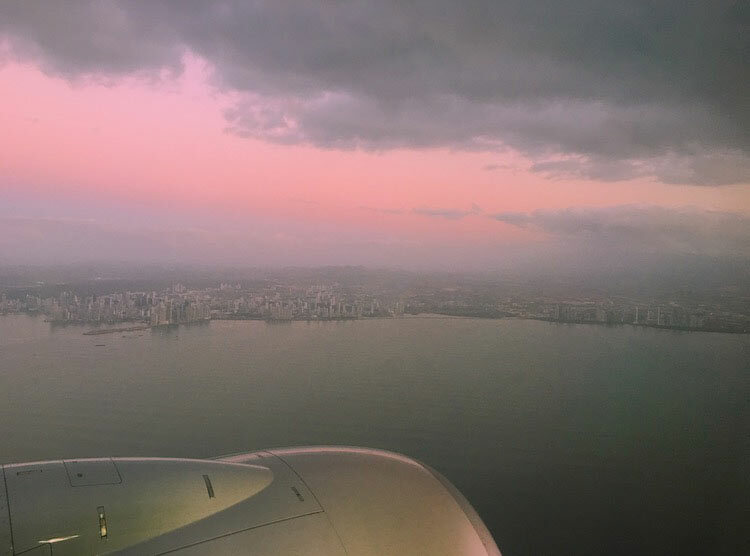 Me and 6 other girls from Loyola Marymount’s dance program flew out of LAX at 9pm on the red eye and arrived in Panama the following morning at 6am! As we were flying in I witnessed a breath taking sunrise as we hovered over the mystic tropical fog. We were greeted by Kimberly in the Airport and caught our bus to Casco Viejo! We are staying in Magnolia Inn which is a hostel in a very popular area. We settled in and got ready to head to a dance show which Tina was performing in with her new company! This was a great way to indulge in the dance community and get a good first look of the entertainment life here in Panama! The venue was a very cool white cement rounded space with ambient lighting boxes on the edges. The performance was very intriguing contemporary theater dance. It was 5 girls all embodying a few different characters. What was different from other dance performances I’ve seen was the gender roles. The females were all very powerful, aggressive, and used their strength to hold eachother up/ push each other around. It was very intense and beautiful, with a mix of score from chimes to tribal sounds to silence at some points. The movement had this highly athletic quality but mixed with a sense of effortless. After the show we had a chance to hang out at the hostel and get ready to go out. We also had our opening reflections and brushed up on our Spanish skills. These reflections were very powerful. They engaged our minds to recognize why we’re here, what we want to get out of this and just how this movement exchange is so beneficial for not only the kids but ourselves as well. Then we had a chance to walk down to the beach which was only five minutes away. We saw some young local boys playing soccer on the beach in this caged soccer field so I jumped in to kick the ball around with them! They may be little but boy were they talented… (Took me a few tries till I actually scored haha). Then we continued on the beach taking pictures along the way. We grabbed a quick mango drink at this outdoor restaurant that had swinging chairs and cool decor. After this we headed to Aki, an Asian cuisine restaurant to enjoy some yummy sushi! Here we got a chance to talk with the Director and hear the history behind the geography of Panama. It was so fascinating to hear the effects Panama has had on the world. After this we returned to Magnolia Inn to wind down before our first day of teaching tomorrow at the Malambo orphanage! Loved reading this Angelica! Panama misses your energy!